I can’t believe the weekend is over already. Have you started planning your Thanksgiving menu? I have the perfect side dish for your menu this year. 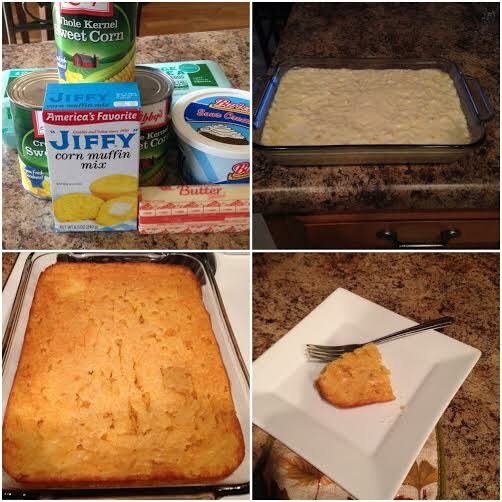 I know it can get boring eating the same thing year after year for Thanksgiving so hopefully you will add this corn casserole to your menu. It is so good and easy to make. It is always a big hit with my family! Preheat oven to 350 F. Grease a 15×10 baking dish. Mix all ingredients together in large mixing bowl and pour into greased baking dish. Bake for 45 minutes or until golden brown. Tip: Casseroles are best if allowed to set for approximately 5 minutes after removing from the oven. Yeah!!! It is so easy and good! Thank you!!! Love the simplicity of this recipe! Thanks for sharing it. Simple and Tasty!!! You’re welcome! !